Big welcome to the large number of new subscribers who have joined our alerts in last 72 hours in response to our media coverage and talk radio shows! We welcome you and appreciate you. New Trump/Kushner Amnesty Threat Next Week! As you can see from new articles (HERE) and (HERE), President Trump's son-in-law (Nepotism) has met with open borders groups funded by George Soros and the Koch Brothers to offer them and Democrats permanent green card Amnesty for 1.8 million illegals in return for 25 billion in wall funds. 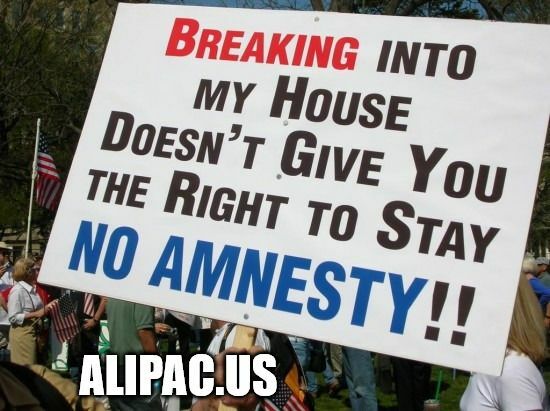 We know from last year's successful battles to stop Amnesty bill HR 4760 in Congress that Trump and Kushner will eventually offer the Democrats Amnesty for 4 million or more illegals for money that will not stop illegals from entering the USA. Our resistance to these Amnesty plans is growing rapidly although most Americans are still in the dark. Big thanks to NumbersUSA for standing up against these Amnesty deals this year and Breitbart news, Rense Radio, and the Hagmann Report for reporting our opposition. Several other important publications and news aggregations sites are still not engaged against this Amnesty. But for now, ALIPAC must refuel! Our funds are very low, and we've had to spend a lot more than usual this week in this battle. A very generous supporter has offered a new matching offer of $500, so please donate now to have it doubled via our secure donation pages below. Last edited by ALIPAC; 01-25-2019 at 01:57 PM.